A thrill just to be nominated. 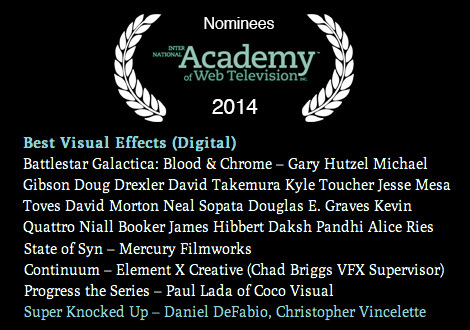 DeFabio Design's work on the special FX for Super Knocked Up has received a nomination from IAWT in the category of Best Visual Effects (Digital). Also in this category is the team from Battle Star Galactica Blood and Chrome, so we're honored to be in their company. To celebrate we added a demo reel of some of those FX here. And the latest episode of SKU is online here. DD did the fire and ice FX in this one.